After a very busy Christmas day, it was just starting to become light on the morning after. I could see more clearly the amount of water that was sitting in the fields, due to the rain which had fallen through the previous 24 hours. 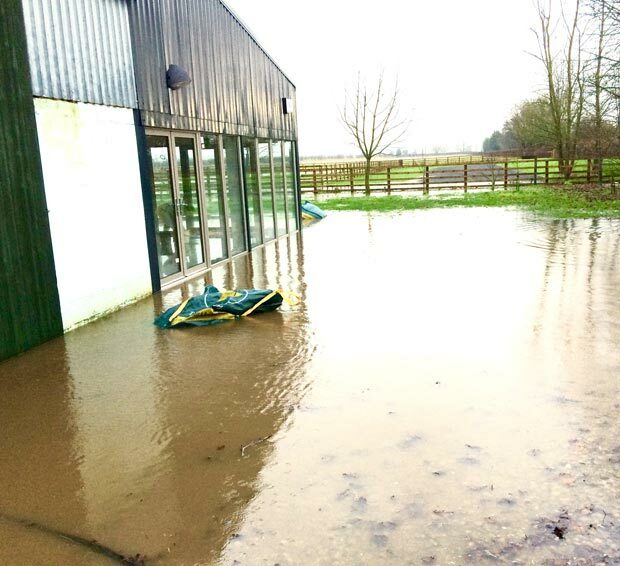 I walked around the outside of the barn and the new shop and tearoom and even there we had standing water. I spoke to a friendly farmer to borrow a pump from him, as I thought if the rain continued, I could use it to keep the levels down. As I drove back through the gate, I couldn’t believe what I was witnessing, the water level had risen by six to eight inches and was now filling up inside our new shop and tearoom. I ran through the torrent which was curling around the barn end and across the bridge towards the house. Thankfully, it was being diverted off the bridge and into the beck, so wasn’t at this stage heading for the house. I just opened the front door and shouted “The water is in the shop, the water is in the shop, get towels NOW” I then waded back over the bridge to get the pump set up and working. Within minutes, I turned to see Wendy and our 3 daughters, in their pyjamas, wading through the water filled barn, with piles of towels under each arm to try and stem the tide, which by this time was running through the new kitchen and toilets too. I called one of our sons who lives 10 minutes away and he came over to help but his brother who had twice tried to come over, had to turn back to Helmsley, due to flooding. I called our neighbour across the road and got them out of bed to muck in. We posted an urgent plea on our ‘Ginger Cow’ Facebook page and on the local Pocklington Facebook page to try and muster up additional manpower. With Wendy now in tears and the water levels still rising as it flowed downhill, off the fields, I did think we were fighting a losing battle. O, ye of little faith! Isn’t it so often the case, that when you think all is lost, you need to keep fighting because things can be turned around. Within minutes we had cars stopping and people jumping out and saying, what can we do to help? We had neighbours turn up with a digger and another larger water pump and before we knew it, we had 3 pumps on the go and literally dozens of people, many we didn’t even know, working hard to get the rising water levels down. I just don’t know where they were all coming from. Before long, both by hand and with the digger, trenches had been dug to allow water to reach ditches and let the water be taken down stream. The tide was turning and still more people were arriving, from Holme on Spalding Moor, Everingham, Bielby, Pocklington, Barnby Moor, Market Weighton, Sutton on Derwent, Driffield and Hull. People were travelling miles to help. As some left, further waves and waves of help just kept appearing. So many angels tuned up that day, changing their plans. Family meals, playing with a new lego set, several rounds of golf, retail therapy and one man even chose to stay rather than spend extra time with his mother in law, now that’s going the extra mile. It’s extremely humbling to see what was set aside to help us in or hour of need and we will be forever grateful.